Yet is it well, if only for purely personal and family reasons, that there should be some abiding record of the self-sacrificing services of all men and women who answered their Country’s call in her hour of need, and who, whether on land, or sea, or in the air, in hospital, or camp, or workshop, were ready to lay down life itself, if need be, that Britain might live and Right prevail over Might. It is for this reason primarily that the present “National Roll of the Great War” was projected. In these pages will be found records of devotion and patriotism of which the individual, the family, and the nation have every reason to be proud. A wide variety of information can be recorded in an entry from units served with, to battles participated in to the nature of the work undertaken. The information in the entries was either from the person concerned or their relatives. The information provided was then edited by those working on the roll into short paragraphs. You need to take care when using the information as there are errors and try to cross reference as much as possible. The great value in the National Roll of the Great War is that it often records information that you will not find elsewhere. If a soldier did not serve abroad and their service record was destroyed then an entry in the National Roll of the Great War may be the only information left recording their service. The second reason that the National Roll is so important is that it combines both biographical and military information. This is important if you’re trying to find a soldier who has a common name and you don’t know anything about their military service. An address was recorded after each entry and this can be cross-referenced with other records, birth census etc. to help you find, or rule out, a possible soldier. Below are three typical entries in the National Roll of Honour. The General Service Medal which was referred to is the British War Medal. Commesky, J. W. 5th Wiltshire Regt. Joining in November 1915, he was shortly afterwards sent to India and thence to Mesopotamia, where he served with the Kut Relief Force and later was present at the capture of Baghdad. Subsequently, he contracted septic poisoning, of which he unhappily died in May 1919. He was buried at Baghdad, and was entitled to the General Service and Victory Medals. “A costly sacrifice upon the alter of freedom.” 84, Devonshire Street, Higher Broughton. Kersh, R. (Miss), Member, W.R.A.F. She joined in November, 1918, and on completion of her training was sent to Netheravon, where she was engaged on important work as a tinsmith. Throughout the period of her service she carried out her responsible duties with the utmost skill and efficiency, and was eventually demobilised in November 1919. 10, Cedar Street, High Town. McDermott, E. Private, 4th (Royal Irish) Dragoon Guards. Mobilised from the Reserve on the outbreak of war, he was sent to the Western Front, and served in the Retreat from Mons, and the Battles of the Marne, the Aisne and Ypres. Taken prisoner on October 16th, 1914, he escaped from Fredericksfeld Camp, Germany and reaching England via Holland two months later, was engaged on Home Defence until discharged on account of service in September 1917. He holds the Mons Star, and the General Service and Victory Medals. You have a number of options when it comes to finding the National Roll of Honour. I use FindmyPast which has digitized all the volumes and has an easy search facility. FindmyPast is a subscription based website but they usually have a free two week trial period. Clicking on the banner below will take you to the website. Ancestry also has some of the volumes digitized but is missing three which “cover the areas of Bradford, Bedford, Northampton, and more of London”. I’m not sure why a genealogical giant such as Ancestry can’t find the missing volumes which have been reprinted to complete an important First World War record set. As Ancestry’s set isn’t complete I can’t recommend using them for the National Roll of the Great War. The books have also been reprinted by the Naval and Military Press and can easily found easily enough online. 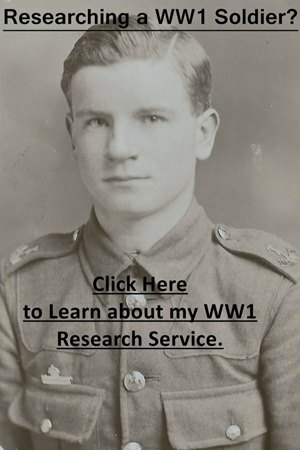 If you are researching a soldier who served in the First World War you may be interested in the research service which I offer.